Allen B. Goodwin and Sam Heys gave a lecture on The Winecoff Fire: The Untold Story of America's Deadliest Hotel Fire on Sunday March 5, 2006 as part of a special program at the Margaret Mitchell House & Museum in Atlanta. The event also included a book signing and began with a reception at 3 p.m. The lecture followed at 4. The program was part of the Fourth Annual Phoenix Files: A Citywide Celebration of Living Landmarks, sponsored by the Atlanta Preservation Center and 19 Preservation Partners. The award-winning, weeklong event -- March 4-12 -- spotlighted Atlanta's historic sites with 56 events at 30 venues. The Winecoff Hotel building, built in 1913, still stands at the corner of Peachtree and Ellis streets in downtown Atlanta. The Winecoff Fire: The Untold Story of America's Deadliest Hotel Fire, published in 1993 by Longstreet Press, was critically acclaimed by a dozen Southern newspapers and went into three printings. It is the story of the victims and survivors of the 1946 Winecoff Hotel fire and of the botched investigation that followed the fire, which remains the worst hotel fire in U.S. history with 119 deaths. In the aftermath of the fire, fire codes were changed throughout America. 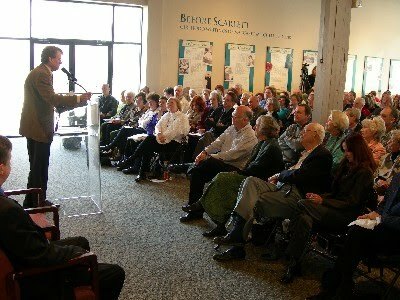 The program drew a crowd of more than 140 people. Following the comments of the authors, those in attendance with a connection to the fire introduced themselves and spoke briefly.. Among those attending were two Pulitzer Prize winners: Arnold Hardy, who took the famous photo of a woman leaping from the burning hotel, and George Goodwin, an Atlanta Journal reporter who witnessed and covered the fire. Also on hand were two Winecoff survivors - Bob Cox of Hays, Kansas, and Bob Irvin of Atlanta. Family members of the following Winecoff victims attended - Patsy Uphold, Christy Hinson, Mary Minor, Earnest Weatherly, Mary Stinespring, and Fleming and Grace Winecoff. Family members of the following survivors were also in attendance - Dorothy Moen Cox, Nelson Thatch, Mildred Johnson, Reid and Cary Horne, and Michael Conners. The daughter of Winecoff firefighter Boots Pittman was present as well. The program was videotaped and may soon be available at nominal cost from winecoff.org.